Its about time for another letter from our side. We are in Tzaneen at the moment. Our total distance ridden from Durban up to Tzaneen is 1896km! We will spend a few days here to rest horses. They are on their second week of the AHS vaccination and have to be rested. ( For the non-horsey people, from the 9th to the 14th day after you have given your horse the vaccination it should not be worked hard and should not sweat. They sometimes have temperature spikes and sometimes they are tired and feel not well.) We have come through some stunning country side since my last email. 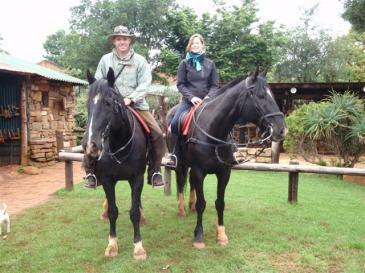 After Kaapsehoop we rode through to Pilgrim's Rest via Sabie. In Pilgrim's we stayed with Vincent. He is a young guy trying to get the old Ponieskrantz Stables up and running again. This facility and the horses are owned by the government. In the 80's this place was in its shining pride! Beautiful Friesians were bred, Horse shows, Pony camps and riding school,.... In 1994 the funding was reduced and slowly but surely the place got forgotten and run down. Some of the horses, though old by now, are still there and being cared for by Vincent who recently found his way to Pilgrim's. He is trying to get the place back to his former glory! His heart is in the right place and we are trying to help him. He wants to restore horse trails in order to buy horse feed, medicines etc. So if ever you go through that way and want to go riding, then please support him. Thereafter we went to Graskop and onto Hoedspruit through the Blyde river canyon. For 3 days through to Hoedspruit and for the first time we had people riding and sleeping over with us for the first time. Traci and Nicola from African Dream Horse Safari joined us with their horses. We had a lovely time! Lloyd and myself enjoyed the company very much and we even managed to get me riding for a day! In Hoedspruit we noticed that Ballantyne had a bit of a sore back. Due to lots of rain and cold weather his muscles got stiff and tight. We decided to rest him in Hoedspruit a while until he recovered. After about 5 days and a great time with Traci, her family and the people from African Dream Horse Safari we were ready to move on. Saying goodbye again. It was hard for both of us. It is always hard but once you are on the road again you cant wait to see what comes up next. horse trails on the farm. Saskia is married to Kobus who used to work together with Lloyd in Botswana. Lloyd has never met Saskia before but he knew of her and she knew of him. Can you believe the co-incidence? How we got to Tzaneen was actually a story in itself. I got a contact number for a lady with horses in Tzaneen. I could not get hold of her and by 3pm we still did not know where we would stay for the night. After I met Lloyd for lunch I decided to drive ahead to look around for a place. The road was an absolute nightmare with cars flying past and virtually no space on the side to ride on. It was just to dangerous to ride on and we decided to somehow find a horsebox and box the horses through. So off I went to Tzaneen not knowing anyone or where to go. I asked a young man on the road if he knew a place with horses anywhere nearby. He did not know anyone but mentioned that there is a vet not far who might be able to help. I arrived at the vet and asked for help. The vet's name was Gert and he helped us so much. He phoned around and found a horsebox and a place for the night. The amazing thing was that, the lady I could not get hold off earlier is working for Gert as his Veterinary Assistant. She was the one he phoned to find a horsebox and an overnight stop for us....??? ?